President of Advanced Mechanical En- terprises, a South Florida mechanical engineering services fi rm, these answers can be found in the oil and gas indus- tries, in the form of online monitoring systems. What is online performance monitor- ing? Today, online performance moni- toring can be described as the process of gathering data from machinery to assess the overall operating capacity of the system it is a part of. Data is com- pared either against an existing database (trending), or a model (model-based), to diagnose existing issues and show the beginnings of wear and tear on mechani- cal components. Technically speaking, “engine” diag- nostics, and performance monitoring go back to the 1700’s. These “primitive” forms of monitoring where ahead of their times and monitored cylinder pres- sure with steam engines, then diesel en- gines, and later critical compressors and engines. Portable diagnostic monitoring really gained footing in the 1960s, when oscilloscopes were used for data collec- tion and analysis in the fi eld. Over the next 30 years, these systems increased in popularity and became known for their successes. In the 1990s, amongst rap- idly evolving technology, and, a boom- ing economy, the oil and gas industry (primarily in gas compression) started utilizing online monitoring as an exten- sion of the successful use of portable engine and compressor analyzers. Over the last two decades, these systems have evolved rapidly as the hardware comput- ing power and software capabilities have advanced. Data collection used to take days to collect and analyze on mechani- cal systems using hand calculations. This can now be done instantaneously and presented in easily readable graph- ics and reports. With a need to provide ship operators with better forms of maintenance to fore- cast problems in an effi cient and timely manner, engineering professionals, such as Merhige, have started to apply this technology to the maritime industry. His system of choice? The 6320/PA by Win- drock. Windrock’s portable analyzers and fi xed systems have enjoyed much success in the oil and gas industries worldwide. Engineers and maintenance professionals use Windrock’s products, both portable and stationary, to monitor, analyze, and troubleshoot machinery. Data can be collected from reciprocating and rotating machinery to trend stress, vibration, proximity, cylinder pressure and temperature. In this capacity, the products have been utilized by big oil to track vital pieces of equipment like com- pression trains, pumps, reciprocating engines and even specifi c components like cylinders, injectors, liners, bearings, valves, rings, and crankshafts. By utiliz- ing systems such as these, remote engi- neering has become very real, allowing for non-intrusive monitoring on a con- sistent basis with minimal supervision, which translates to minimal expense. What does the marine industry stand to gain from these systems? How can ship operators facilitate an online monitoring program, and what will it mean for their budgets? 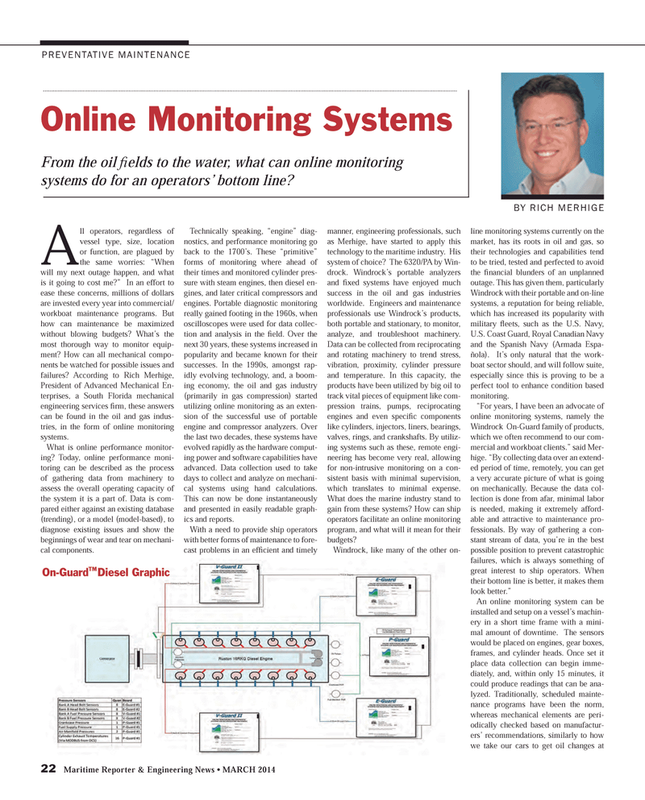 From the oil fi elds to the water, what can online monitoring systems do for an operators’ bottom line?